Adventure into the deep blue sea, and find the ultimate king of the dolphins. Click here to play! Journey into the ocean and resurface with some incredible cash jackpots at this exciting slot. 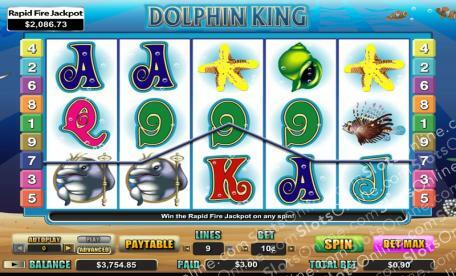 Dolphin King is a wonderful 5-reel slot played across 9 unique pay lines. The Dolphin King is the most lucrative symbol on the reels and, as the Wild, can be subbed for anything else in order to complete winning combos. If you manage all five Wilds on an active pay line you will be rewarded with 5000 times your initial stake. If you land two Kings in a combo, the prize will be doubled; and, if he lands on reels one and five, you will be rewarded with 20 free games. The Pearl is Scattered and can appear anywhere on the reels, and even win you 100 coins on the best possible spin. Take your time, and discover the beauty of the Dolphin King today! The Pearl is Scattered and can not only earn you up to 100 coins, but also appear anywhere on the reels to earn a payout. The Dolphin King is Wild and can be subbed for any other symbol on the reels, except Scatters, in order to finish off winning combinations.